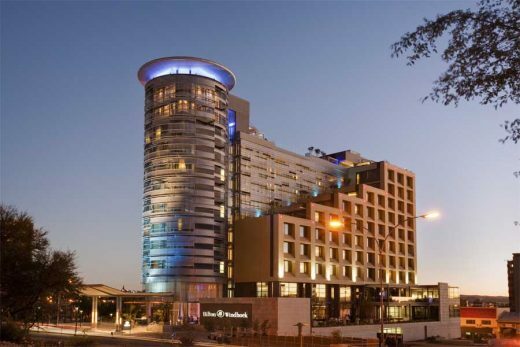 The new Hilton (Eliakim Namundjebo Plaza) Hotel in Windhoek, Namibia, forms the first phase of the proposed Freedom Square development, an 80,000m² mixed-use precinct in the heart of the capital set to transform the urban face and dynamics of the CBD. 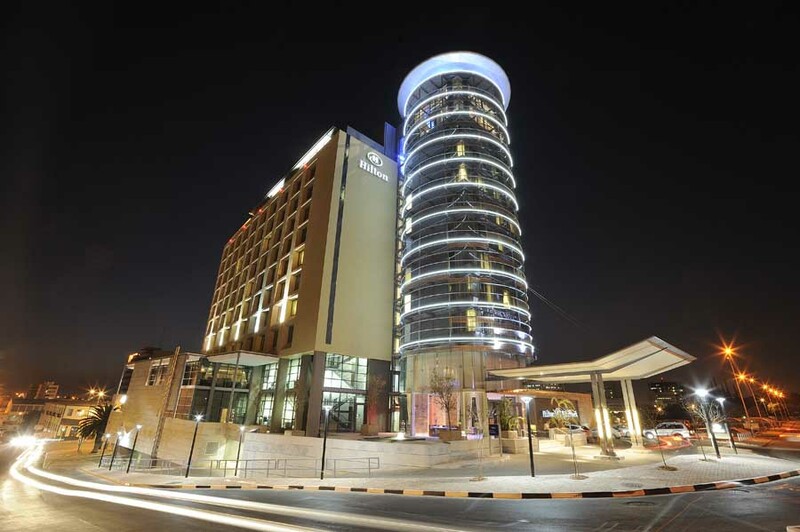 Prominently situated as the city centre is entered from the Hosea Kutako International Airport along Sam Nujoma Avenue, the hotel occupies the southernmost portion of the larger property and is hemmed in by streets on three sides. The elevated Supreme Court and Bank of Namibia overlook the site to the east, and the City Council Building to the south. The Hilton enjoys panoramic views of the city and surrounding mountains to the west and southwest. It will also have a commanding view of the new development to the north and, in particular, the tree-lined pedestrian spine alongside which the retail, office, and other components will be arranged. Announcing the hotel to the approaching guest and marking its main entrance is a 40m high glass-and-steel tower. The prominent entrance drum links to a full-height atrium from where all public functions in the main building can be reached: the lounge and coffee shop, banqueting halls, meeting rooms and terrace on ground level, and an all-day dining restaurant, cocktail bar and terrace on mezzanine. Natural light penetrates the building interior through the partially glazed atrium that, along with other double volume spaces, creates visual links between the various levels of the building. An executive lounge is located on the upper two levels of the glazed drum and links to a rooftop pool, poolside cabanas, a gym and wellness facility, and a terrace bar. Legibility and transparency were important design considerations. A strong circulation axis and visual links ensure clarity of public circulation, both horizontally and vertically. The idea of illuminated boxes within a legible building structure is applied as a constant theme for design elements such as retail shops, offices, bars, reception desks, and selected service components, with varying degrees of transparency reflecting the required levels of privacy. Animated by the illumination of the panoramic lift cars, the twinned main lift shafts are expressed as glazed vertical boxes penetrating the total height of the building. Conceptually the Hilton was perceived as a beacon of urban nightlife in a digital age, celebrating arrival and local culture with art and imagery, thus providing Namibia’s capital city with a public landmark comparable to Piccadilly Circus or Time Square. International hotels as public landmarks, besides being welcoming, sophisticated places where comfort of stay takes precedence, in some instances can be likened to entertainment theatres, escapes from the mundane where luxury, wellness and the green agenda are eminent and nature is invited in. The sophistication in the new Hilton Hotel lies in the interplay of understatement and decoration, of excitement and relaxation, of food and drink, and of high technology and nature. The selective use of decorative sculptural lighting and glass in different shades and colours provides focus where celebration is required. Comfort is achieved by capturing an ambience of homeliness and intimacy whilst being universal, accessible, climatically responsive, and by encouraging ease of communication. As an entertainment theatre, the new hotel at night performs as an art gallery or urban stage with large glazed areas displaying its activities to passers’ by. The transient character of theatre is expressed through the inventive use of LED lighting in changing the ambience and appearance of interior spaces and external facades. Nature is invited into the building in different ways. The expanse of the great Namibian landscape is reflected in the generosity of public spaces whilst the colours and natural textures of the desert and arid landscapes of the country provided a distinct palette for the building interior and exterior. A restrictive range of colours, textures and materials is applied, but with the necessary contrast where needed. Building materials are a combination of sand coloured stucco and local granite on the facades. Succulents and plants from the region, indigenous trees, stone, and water features are also applied in a way so as to emulate the natural landscape of Namibia. From a green perspective the heat of a nearby hot spring will eventually be utilised in the larger development for purposes of heating: green roofs, solar control, intelligent lighting, thermal glass and ventilated cavity walls are also used.